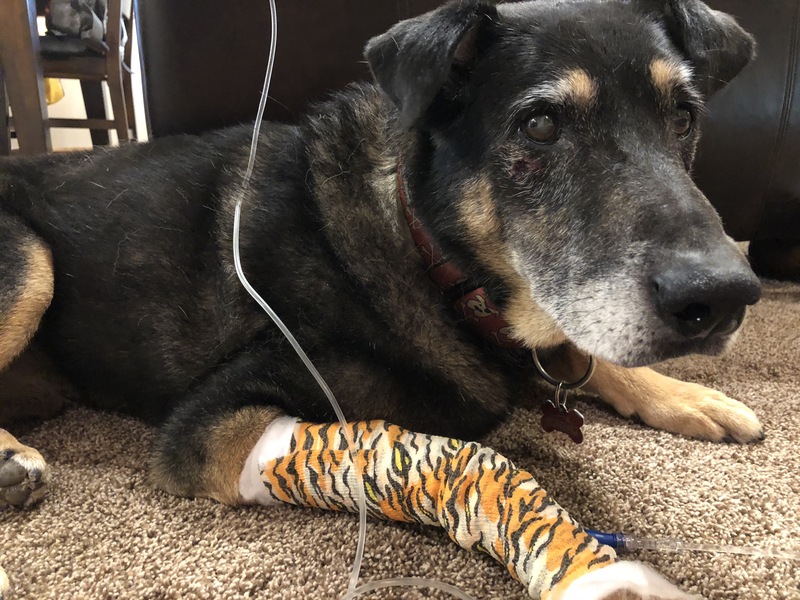 OPINION — While hiking last week, our dog had a significant fall. As a result, we met two amazing men from Ivins. We want to share the story. 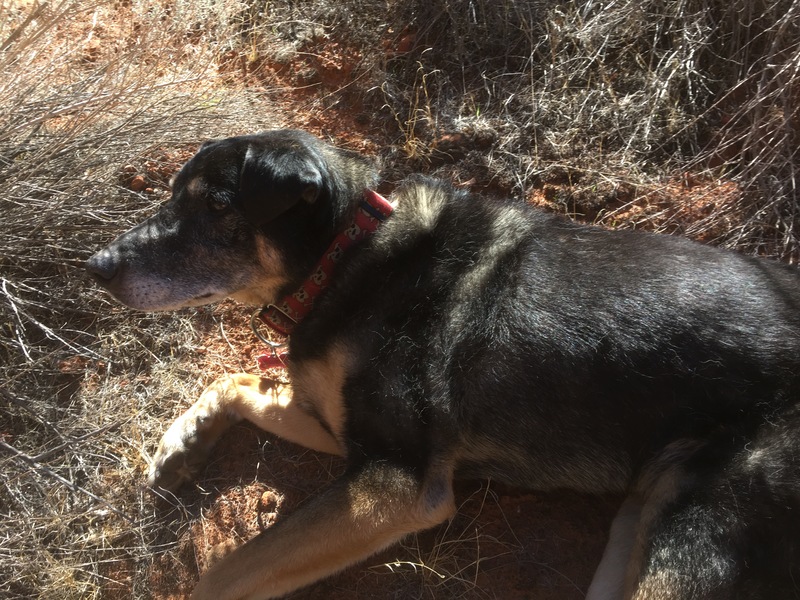 “Oscar” is our 16-year-old mixed breed mostly shepherd who is driven by his love of hiking. This has motivated us to stay active and it also is the reason for many a trip to share new adventures. 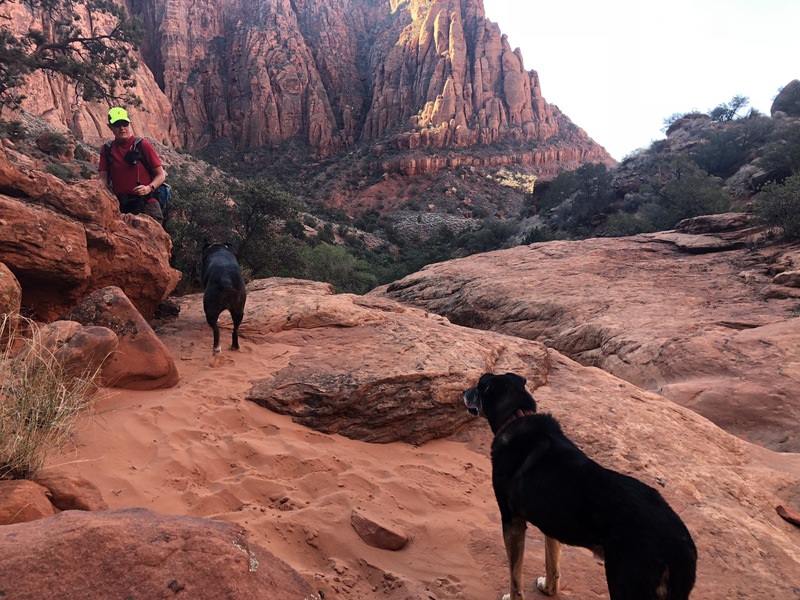 We generally take a yearly trip to St. George and take our dogs out for hikes. Some of our favorites are also the favorites of our dogs. “Kaiya,” a heeler mix, particularly loves Hell Hole because of its terrain replete with lizards and frogs in a small rock hole. Oscar loves this one because it allows him great room to wander. Unfortunately, the years have taken their collective toll on Oscar but have not dented his desire to hike. He has a pretty worn spine with bone spurs causing him great unsteadiness in his back legs. On many trips, we’ve tried to leave him back for fear he would be incapable of completing a hike but he gets really anxious when we do. On the morning of Oct. 10, he was up and ready to go because the previous day we had given him a rest day and he wanted to make sure that didn’t happen again. We had planned to do a quick hike so we could get back and watch a friend compete in the Huntsman World Senior Games, so we chose Hell Hole. We knew the last bit would be a challenge but thought we could find a way around it by going up the wash. Our intention was to avoid the last cross from one plateau toward the Hell Hole just because of its steepness. We tried the wash, and it turns out the boulders were more difficult for Oscar than climbing some loose ascents to the plateau. So we climbed out of the wash and made our way to the nice dry rock waterfall area that marks the area we didn’t want to take him on. He of course got too close to this waterfall making us very nervous, and we explored a lower trail that didn’t have the loose rocky ascent that the regular trail has. Right at the point we decided to stop and rethink this option, Oscar took a wrong step and lost his footing down the rock face, quickly falling just out of our reach and down quite a drop-off. We watched it all happen to our horror not being able to stop him. He came to rest about 50 feet below in the wash, wedged between a large boulder and an imbedded rock. He was facing uphill, so we could see his terrified gaze. We struggled down the path and found him to be bleeding under his right eye, breathing rapidly, but alive. We had to find a way to get him out, and he wasn’t tolerating weight on his back limbs. We attempted a sling with our rain jackets and hiking poles but it was too unstable and difficult to carry him. The best option was to carry him and cradle him like a baby or try to put him on my shoulders. Unfortunately, the shoulder thing didn’t work too well as I turned my ankle and came crashing down with him up on my shoulders. He was okay, but I was worthless to carry him for the rest of the scramble. We did our best carrying him about 10 feet and then having to lay him down to recover due to difficult terrain and exhaustion. Every transition caused him great discomfort and he would let out a primal yelp in pain. We did this until we hit a bit of an impasse and were plotting a path around the dry rock waterfall we were facing. It was about this time we heard two voices. I was pretty sure they were on the proper trail above us, until they appeared to keep getting closer to us. I walked up the wash a bit and there was Dan and Steve walking down the wash. I expected nothing from them except information on the path through the wash as they appeared to prefer that route. They said they had come up the wash and thought we were about at the section where they had dropped into the wash so they thought we could get out soon. Then, they insisted on helping with Oscar and before we could argue, they were cradling him, comforting him and getting him out of the wash. 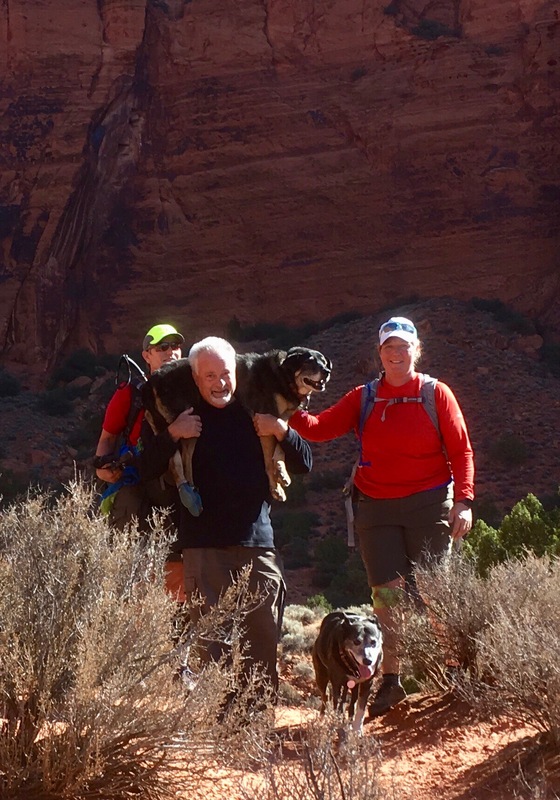 Eventually we decided to let them get Oscar up on their shoulders and they took turns carrying him out of the wash, up to the trail, down the rocky loose descents and eventually to their Jeep that was parked in an upper Kayenta parking lot. This was a several mile journey. They took time to comfort and talk to him and assured him they were going to get him out. We found out they were both retired and had taken up residence in the St. George area — Steve from Centerville and Dan from the Denver area. They are both dog lovers and insisted that it was their destiny to have come along when they did to be able to help Oscar. I am not a prayerful person, but I had asked for help just before Dan and Steve showed up. I can’t imagine how long it would have taken for the two of us alone to get Oscar out and how difficult it would have been. We cannot even begin to express our gratitude for the two of them as they carried our dog, assured us we would get out, arranged for a vet to see him and checked in on him throughout our emergency vet visit. This sort of kindness cannot go without recognition, thus why we shared this story with St. George News. I can only imagine how fortunate the residents of the area are to have quality human beings like this living among them. I know I have grown pretty jaded about human nature and potential in the current political atmosphere, but this act from two truly kind and capable men has done so much to restore my belief that people are basically good. Thank you to Dan Glassett and Steve Elliot. Oh yeah, thanks to Dr. Moe Bracken and his staff as well. Turns out Oscar hadn’t broken anything and required an IV and some tender care. We are now back in Salt Lake City and Oscar is enjoying his rehab, which involves rice, pumpkin and ground beef lunch and dinner, as well as a new ramp installed on our back staircase. Submitted by ANNE THACKERAY, Salt Lake City. Dont leave glow sticks in the Hell Hole! Glad he made it out in one piece of fur. BTW how come teens dont take that hike? They might not come back!